Scroll down and click on any thumbnail (small image) to bring picture into large window. Click on window to view as full page and then use buttons at lower right for magnification, single image downloading, sharing, and more. To advance to next page click arrow to right of thumbnails. To select any page for viewing click arrow below thumbnails and use drop-down menu. Selected astroimages from 2004 through 2017 including galaxies, light and dark nebulas, planetary nebulas, globular star clusters, open clusters, and miscellaneous objects. Images are in approximate chronological order with exceptions. Earliest data were captured with a SBIG ST8-XE or STL-11000M research grade CCD camera and Takahashi FSQ 106 astrograph refractor or Optical Guidance Systems Ritchey-Chretien 12.5 inch telescope operating in Palm Springs, California. Beginning in April, 2008 some images were obtained on a 24 inch R-C telescope with 11000M camera atop Mt. Lemmon near Tucson, Arizona. In October, 2010 this was replaced by the 32 inch Schulman Foundation R-C telescope (generally known as the "Schulman telescope") maintained on Mt. Lemmon by the University of Arizona. The 11000M camera initially used on the 32 inch scope was replaced by an STX-16803 in early 2011. Image capture and processing for the images displayed here utilized specialized software including TheSky6 Professional Edition, ACP Planner and Capture, CCDStack, Adobe Photoshop, Noise Ninja, MaximDL, RegiStar, PixInsight, FITS Liberator, Filezilla, and CCDSharp. Total exposure times for each image were typically 3 - 6 hours and in some cases over 20 hours. Luminance frames were generally processed separately from RGB color composites which were then united in Photoshop. H-alpha blending used various techniques. Features on this site include a search function, user-controlled slide show, full resolution downloads, variable magnification, and easy purchase of prints or other products (coasters, cups, etc.) with images of selected items. To access some features use the "search", "slideshow", or "buy" buttons. Functionality may be incomplete with cell phone viewing. All material is copyrighted. Downloading images for personal use is free. Prints and image-bearing products may be purchased directly from this web site or made yourself from downloads. THE 32 INCH SCHULMAN TELESCOPE AND ITS SUPPORT SYSTEMS ARE ENGINEERED FOR FULLY REMOTE OPERATION AND PROVIDE AN IMPORTANT FACILITY FOR WORLDWIDE USE OVER THE INTERNET BY AMATEUR AND PROFESSIONAL ASTROPHOTOGRAPHERS AND ASTRONOMERS. For further information and to obtain access please visit the Schulman Telescope web site at www.schulmantelescope.org or contact the University of Arizona Science SkyCenter (Mt. Lemmon SkyCenter) at http://Skycenter.arizona.edu. Email to jds4@ix.netcom.com for questions, information, or commercial use. 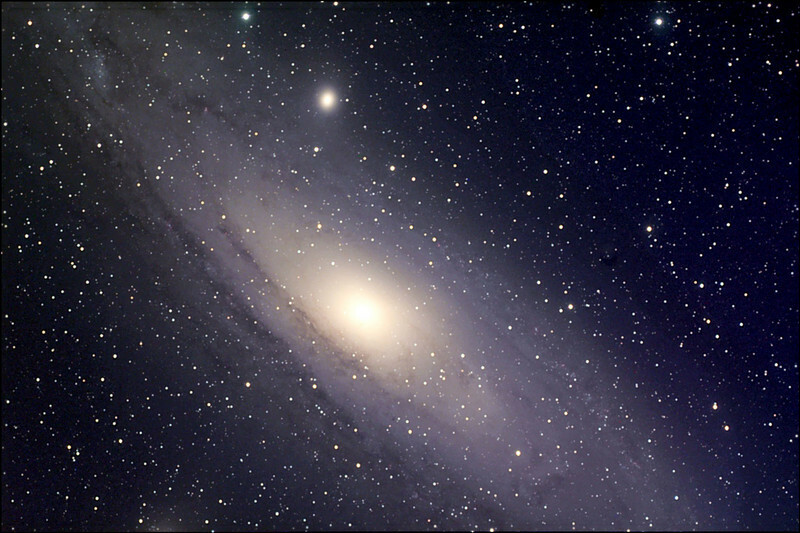 Messier 31 Andromeda galaxy, with smaller elliptical galaxy Messer 32. In remembrance of Constance C. Smith.